It’s bad enough that for a second year running our child poverty rate is at 30%, largely driven by social security cuts, but for hard-pressed families there is worse to come. We are only half way into a four-year freeze on children’s benefits that is hitting family budgets very hard. Child benefit alone will lose 23% of its value over the decade so low-income families are losing core support as prices rise. ALDE leaders met in Brussels on 22 March 2018 at the Egmont Palace. At the meeting, liberal leaders showed their support to the leader of the Liberal Democrats Vince Cable. However, no statement was agreed upon or issued at the meeting. As the Times’ Bruno Waterfield points out, there was another error in the Lib Dem press release. More from my colleague Jessica Elgot on the Lib Dem snafu. Lib Dems say Brexit referendum statement was a verbal agreement in the meeting with the eight prime ministers (well, eight-ish, seeing as one has resigned this month), not a formal statement signed by the parties. It was an unusual statement, because prime ministers are usually loath to interfere in the internal affairs of other EU countries, and it seems as if the Lib Dems may have jumped the gun because the Alliance of Liberals and Democrats for Europe – the liberal group in the European parliament, to which liberal PMs are attached – has now disowned the Lib Dem press release. As my colleague Jessica Elgot points out, the original press release also contained a mistake about the Slovenian prime minister. Miro Cerar has resigned as prime minister of Slovenia this month so does he count as one of the eight who signed, but didn’t actually sign, the Lib Dem statement? On the plus side, that means that only seven PMs have retracted the original statement – not eight. Matt Hancock’s busy day of media appearances continued with him speaking at a Press Gallery lunch. In a question and answer session, the culture secretary said “the system is not good enough” when asked if he was happy if the Cambridge Analytica stand-off. He hinted that he would grant the information commissioner, Elizabeth Denham, additional powers by introducing amendments to the data protection bill that would give her additional powers “to go in faster” once an investigation had begun and that the commissioner should be able to force individuals to give testimony. At present the commissioner’s powers only extend to companies, which means that former employees of Cambridge Analytica can avoid answering questions if they have quit a company under investigation for privacy breaches. When asked if it was time for the government to stop advertising on Facebook, the minister said “we haven’t gone there yet”. He argued that Facebook remained an effective form of communication despite the scandal. There was also a none too subtle side swipe against his opposite number Tom Watson, arguing that it was only the shadow culture secretary who “thinks it is a good idea to put Max Mosley in charge of regulating the Jewish Chronicle” – an inaccurate reference to the fact that Mosley’s charitable trust provides arm’s length funding to Impress, the only officially recognised press regulator. “Like most conspiracy theorists, when a real conspiracy theory comes along, he doesn’t take notice,” Hancock said. Other jokes were less controversial. Hancock said parliamentary business meant that he arrived late to last month’s annual Brit music awards after dinner had been served. The minister said he was sitting on the same table as Rolling Stone Ronnie Wood. Upon hearing of the minister’s hunger, the guitarist searched his bag for “a bit of a pick me up …. which turned out to be a Babybel for one of his daughters”. The final stage of the Scottish government’s EU continuity bill was passed late yesterday evening by a Holyrood majority (except Scottish Conservatives) and the question is: what happens next? The continuity bill, whicht ransfers EU regulations directly Scottish law in the event of the Scottish and UK governments failing to agree a deal, puts the Scottish parliament on a potential collision course with Westminster. Holyrood’s presiding officer has already ruled that he considers the bill to be ultra vires, while the UK government has also hinted that it may challenge its legality in the Supreme Court. There is no expectation that the UK government will go to court before it gets royal assent, after which an act of the parliament can be challenged in the courts by any party with a relevant interest. Although Scotland’s highest law officer, the Lord Advocate James Wolffe, has previously given his opinion that he believes the bill to be within the competency of Holyrood, there is a debate in legal circles about whether he may refer it to the supreme court now to preempt a later challenge. Wolffe now has 28 days in which to refer the bill to the Supreme Court. Alexander Hix, the suspended boss of Cambridge Analytica, has been summoned to give evidence for a second time to the Commons culture committee. In an open letter, the committee chairman Damian Collins said the MPs wanted to ask him about discrepancies between what he said in previous evidence and recent revelations about how Cambridge Analytica has exploited Facebook data. There were “a number of inconsistencies” in the evidence, Collins said. Giving “false statements” to a committee was “a very serious matter”, he added. Mr Justice Williams has made a ruling following a hearing in the Court of Protection, where issues relating to people who lack the mental capacity to make decisions are considered, in London. He said both Mr and Ms Skripal were unconscious in hospital in Salisbury and therefore unable to give their consent to blood samples being taken or tested. The judge, who is based in the family division of the High Court in London, announced his decision today after analysing the case at a private hearing earlier this week. Eight Liberal prime ministers from across Europe, almost a third of all EU members states, have signed a joint statement backing a referendum on the final Brexit deal, including Dutch leader Mark Rutte and Belgium’s Charles Michel. The prime ministers, who met Liberal Democrat leader Vince Cable in Brussels ahead of the EU summit, said they would back any move to reverse Brexit and said the British public should be given the chance to vote on whatever deal Theresa May reaches with the EU. The statement was signed by Rutte and Michel as well as Luxembourg’s prime minister Xavier Bettel. The Czech Republic’s Andrej Babiš, Slovenia’s Miro Cerar, Denmark’s Lars Løkke Rasmussen, Estonia’s Jüri Ratas and Finland’s Juha Sipilä has also signed. We regret Brexit, but acknowledge the choice made by British voters for the UK government to negotiate withdrawal. 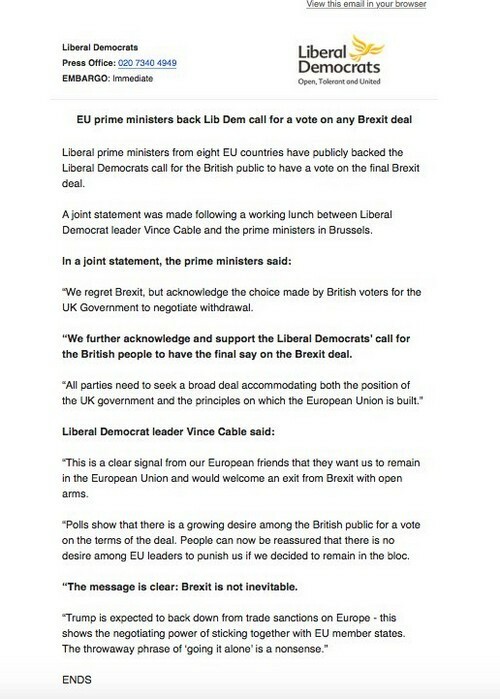 We further acknowledge and support the Liberal Democrats’ call for the British people to have the final say on the Brexit deal. All parties need to seek a broad deal accommodating both the position of the UK government and the principles on which the European Union is built. UPDATE: This initiative has rather backfired. See 4.41pm for more.